Every horse's musculo-skeletal system is a marvelous, perfect and beautiful thing, when moving correctly. The pursuit of mental and physical harmony with our horses has to be the ultimate riding goal. That is where the magic happens. Our traditional training methods aim to build a horse's muscles, reactions and fitness to power him when jumping over things, galloping fast or performing impressive dressage movements. There are, however, key muscles deep within the horse’s that can remain weak in even highly trained horses leading to self-restraint in the gaits, bad backs and tension. A complex system of internal muscles controls the elasticity of the horse’s spine including the Psoas, Multifidus and Abdominal groups. Their condition is as important to good movement as the big ones on the outside. From a riding view, core weakness shows itself with crookedness, limited performance and a general feeling of having to work too hard to control or follow the horse's movements. All in all, a weak core makes a horse difficult and uncomfortable to ride and for some, the body damages itself by using itself incorrectly over some time. A clue to the origin of a disconnected ride are the symptoms we encounter when we are aboard. Over the years it has become obvious that whatever the build, breed, discipline or even history, the same groups of resistances are experienced by most horses and their riders, only intensity varies. Bad backs are often disguised as schooling issues until they become severe enough to easily identify. The horse cannot learn when there is a physical restriction somewhere, and they certainly can't concentrate enough to learn when in pain. Perhaps we are similar in this way also. 'Equine Core Strengthening' is a ridden system of correcting and conditioning a horse's core muscles using Yoga, Dance and Sports techniques, adapted for horses. By precisely targeting the core muscles and spinal condition, we can gradually loosen, mobilise then strengthening this vulnerable structure under the guidance of the rider, The pair can together develop a permanent understanding of what improved self carriage feels like and develop those skills together. Spinal Crowding Syndrome is a precise term for the complications of a hollow back, and can be slight to severe. Evolution has perfected the horse's skeleton over millions of years to make him/her a great mover, but it did not make the horse's back naturally strong enough to carry a human. However big and strong they appear in the shoulder and haunches, the long back is untrained and already has the heavy belly to carry. This closes the already narrow gaps between the vertical spinous processes of the thoracic and lumbar vertebrae. As his work progresses into trot and canter he can begin to feel discomfort as the nerves running between the processes risk becoming rubbed and if not corrected, pinched. To limit the discomfort of this pinching, as training becomes more demanding the horse will instinctively tense his back muscles and 'lock' the area to limit the processes rubbing together, and consequently over stretch the limbs to compensate for the lack of motion in the spine. As horses are creatures of habit, once this defense begins it is likely to continue and s/he therefore loses the natural flexible qualities of the spine that are key to the elastic connection of the large body sections. As s/he is asked to perform more trot and canter work s/he responds not with flexing through the body as it should, but by over stretching the limbs articulations and throwing the pelvis to the inside, thus triangulating the gait and making it crooked. It is for this reason so many well bred horses are graceful in the field as youngsters yet as adults seem to lose their natural cadence under saddle. We are sitting on the weakest link. The complex system of muscles that maintain the spine's alignment, particularly when the horse is in motion, are called the Psoas, Multifidus and Abdominal muscle groups. These are the body's 'core' muscles and need to be strong and short to counteract spinal dipping and keep the gaps between the processes open when carrying the rider. When our horses become more mature and we ask for work in a more advanced outline, if there is any dynamic misalignment in the spine, the Longissimus Dorsae muscles over the back can become very tense to defend the spine from the potentially uncomfortable twisting motion. This is not a conscious choice for the horse, simply instinct. Some horses stabilise and learn to work like this, by becoming sufficiently supple in the limb joints, although their gaits will be crooked, one-sided and limited. In some cases horses experiencing this syndrome develop very tense back muscles leading to severe behavioral and riding resistances in response to pain. At that stage it has possibly become a 'kissing spine' where the vertebrae have become kinked by the strong Longissimus Dorsi muscles in spasm, where the processes are touching and crushing into each other concussively. As horses do not express pain as other mammals do, over time the strong Longissimus drags the vertebra out of line, called Spondylosis. This is when we often seek answers as the horse has become, quite understandable, very reluctant to be ridden. A secondary effect of the spine losing elasticity is that kinetic force is thrown forwards towards the shoulders as it can no longer be absorbed through the horse's centre. This pushes the lowest part of the cervical section of his spine, the base of the neck, downwards between his shoulder blades and robbing him of forehand 'suspension', plunging him downhill, onto the forehand and heavily into the rider's hand making straightness and balance physically impossible. This further brings issues along the spinal column, where the limited angles between vertebrae are exceeded. If horses show very inconsistent and evasive contact on the rein, it is possible that the C7/T1 junction is being asked to excees it's natural angle by working in a competition outline when the back is hollow under the saddle. This will cause discomfort and resistance in riding. Considering the cause, the horse shows amazing tolerance, to their detriment unfortunately. Simply asking the horse for more forward effort in an effort to engage the quarters will not build the core systems, particularly if the spine has learned already to dip as the horse is working against himself. In fact, more impulsion worsens the problem. In motion our bodies are just a biological mechanism, a machine for moving around. As with any machine, the angles that forces travel must be carefully aligned. A car with a flat tyre will pull heavily to that side for example. Any mechanical misalignment will wear parts quickly due to the excess strain put upon them. When the horses spine, or 'chassis' is misaligned, all the subtle dynamics of limb flight and joint trajectories are thrown out of line causing all sorts of imbalances, restrictions and excesses. As difficult as it is for the horse to do as asked under these circumstances, things are almost as awkward the rider who is severely jiggled about or even downright ejected, unable to ride in a soft, light way and therefore reinforcing the horse's tension. Our aids then become impossible for the horse to understand creating a vicious circle of defensive tension that is tricky to break. As horses are generous and silent triers they don't yelp in pain like people or other pets, making the initial signs of spinal crowding hard to notice. The signs are often seen as individual problems with no common cause, but they do have telltale predictability. As spinal crowding symptoms come in groups, we can start by giving each horse a 'Core score'. If we were to ride a horse and score his way of going on a scale of 0 to 5, where a 0 is a faultless, free and strong spine and a 5 score is a painful kissing spine, here is a table of symptoms as a guide. Hoof flares are a good example. The 'sway' of hoof growth on one side of the foot shows a repetitive lateral slide of that limb, like a car tyre under cornering. The presence of forces from a direction which the limb was not designed can form all manner of reaction over time. Bony growths, joint swellings, self interference and excessive wear show that a body part has endured excessive repetitive strain. By correcting the horse's core strength, these ailments and injuries tend to diminish, heal or disappear altogether. If we want our horses to dance, we must train them as we do a human athlete. Continuous analysis of human training methods has us concentrate upon core suppleness and strength before adding power and speed. With human athletes we discovered long ago that the core must be in excellent condition or peak, painless performance will never be achieved. We must return the horse to a natural balance. A balance that they were perfectly designed to have by Mother Nature, flexing throughout the body, with movement flowing from the horse's centre outwards. If a Grand Prix Dressage performance is comparable to a Ballet then it is obvious that the traditional practice of a walk, trot and canter on a loose rein both ways is simply not enough to properly condition a horse for movements that require a high level of balance, suppleness and flexibility, as it will just loosen the legs. The whole body must be trained, weak areas made strong and then what was difficult becomes easy, beautiful and sustainable. Comparable anatomy allows for unifying principles to emerge. If it does us good, the horse will benefit also. Equine Core Strengthening takes human body conditioning disciplines such as Yoga, Pilates and recent developments in kinetic chain sports training, and applies these principles to the horse's weak areas with the same philosophy of controlled, progressive strength building movements under saddle. As the exercises are performed in partnership with the rider, this not only produces the physical conditioning and confidence that the horse needs but also dramatically develops the psychological and physical bond between the partners to make advanced work possible and more harmonious. Below are four introductory exercises that look quite simple, and in a sense they are, yet they will produce a noticeable improvement in the horse's willingness to flex through the spine. They combine stretch and twist motions at low speed that break down the defensive 'locking' habit of the back, to encourage the horse to learn to let go and allow progress to the strength building phase of exercises that will develop true engagement under impulsion (see part 2, Core Correction – Advanced). The movements should be repeated slowly and deliberately until fluid and easy, in a similar way as a pianist would repeat the scales to perfection. As SCS is in part a psychological defense the effect is not only a strengthening of the horse's core but also to practicing the basic 'language' of movement between horse and rider that will increase ease in a performance by developing trust at the same time as strength. Quite simply a small circle of around 6m around a cone or block with long reins and lots of inside bend. This stretches defensive back muscles and helps the horse to let go of lateral back tension. Don't insist, encourage. Relax, wait and repeat until the head drops lower and lower towards the sand as muscles gain confidence into the stretch. Perform initially from walk to get the idea, then in rising trot. Repeat until the horse feels more fluid and willing stretches down and forward into the bend. The Yoga 'Half Moon' has the same effect on our bodies as it does on the horse. As with the revolved triangle for people, a stretched leg yield encourages the hips to rotate in the opposite direction from the shoulders, encouraging the spine to twist freely and gradually release it's kinks. The horse may initially block himself. Persist sympathetically and he will let go, drop his head willingly to the inside rein and step sideways with more and more elasticity. Great for opening gates and even better for activating the Psoas system. This exercise works on many levels and when perfected later on, the horse will work in a very fluid outline. It teaches the horse to move away from a light inside leg which is the basis of straightness control, lateral work and precise cornering later on. It also builds the lateral and rotative pelvic control muscles, as well as simultaneously lifting the spine and separating the processes to relieve impinged nerves. Get one or two correct steps before asking for more. The horse must step under his body with the inside hind and rotate his quarters around the inside fore. Back up the inside leg with a gentle whip aid to get the first steps and watch out for evasions such as stepping backwards and walking out of the outside shoulder. When the horse easily drops the inside rein to you and willingly gives the outside rein a contact, the correction has been made. This is essential for suppleness in the shoulders and rider/horse communication. From standstill with an open reined inside bend, increase the outside rein pressure until the horse steps away from the aid. This develops thoracic sling motion range, encouraging the horse to carry his spine higher between his shoulder blades. This raises his centre of gravity and gives him the ability to push his front end upwards in each stride making his movement 'uphill' and supple, and allowing a space for his rear end to engage into. The result is light outside rein influence of the shoulder, allowing precision turns and the key to easily controlled shoulder in, half-pass and pirouette. When beginning this work the rider must think of a gentle, suppling guidance as the resistances are a combination of psychological as well as physical. Great care needs to be taken to ask for more effort and strength only after the horse has let go of his defenses. Long and low will stretch the horse but when you have an improvement, do the exercise at least once 'on the bit'. If you can't sit to the trot or canter, don't. Use the exercises to get more spinal freedom and then try later when the gait feels smoother. These exercises are part of a retraining programme that can be used as a warm up to a horse's daily workout. If practiced daily, in a very short time horses achieve more from their schooling as they start the strenuous work after having been stretched. To fully train the body of this athlete the full Equine Core Strengthening programme consists of 12 low impact mobility and co-ordination exercises based upon Yoga and dance training. The second phase is 8 Core Power exercises based upon current sports training including Kinetic Chain, amongst others. When a horse has achieved a core score 0, then we can choose a preferred method of equitation whether it be Podhajsky, De La Gueriniere, Savoie, The Scales, etc. The horse will now be in the physical condition of those that these principles were developed to apply. One must remember the circumstances under which they were written are not those of today's equine marketplace. Having sympathetic therapy specialists is also vital for overall musclular wellbeing. Who doesn't feel better after a massage! Well, my friends, I hope these words are interesting and of use. Please don't hesitate to contact me if you have problems, breakthroughs or wish to go further with this method and please, never forget that the gentle willingness of horses is their most precious quality and the one most loved by us humans. If we truly want to bond in motion with these creatures, we must reciprocate by recognising the silent signals of difficulty that are hidden by their innocent generosity. 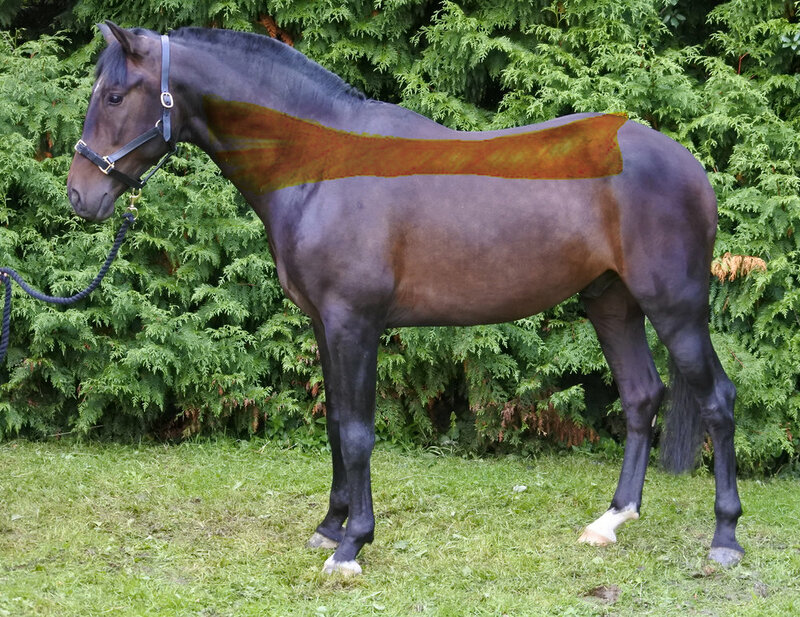 3.Walmsley JP, Pettersson H, Winberg F, et al: Impingement of the dorsal spinous processes in two hundred and fifteen horses: case selection, surgical technique and results. Equine Vet J 34:23 – 28, 2002.